May is coming in a few days, which means it’s time to start preparing for summer. For some of us, this meas breaking out the sandals and pumping up your bike tires. But for you Modern players out there, it should mean getting ready for the Grand Prix blitz that is coming in June. And there’s no better way to prepare for those events than tuning up your Grixis Delver for tournament glory. I wrote about this deck last week and can’t emphasize enough just how strong this deck is looking going into the summer. Its enjoyed an unprecedented rise on MTGO that has even converted into enough paper showings to cement tier 2 status. It has all the cards and synergies needed to succeed in this metagame, and it also boasts one of the best UR Twin matchups in the format. So if it’s a hot deck you want for summertime Modern, look no further than the newest face of Delver of Secrets in Modern. Although Grixis Delver has seen a lot of success in the past months, much of it has been isolated to MTGO dailies and regional events. We haven’t experienced a Modern GP since February, and it will be just over three full months between GP Vancouver and the next GP on the horizon (GP Charlotte). Grixis Delver might look good now, but it hasn’t proved itself on one of Magic’s biggest stages. That also means its different lists aren’t as tuned, optimized, or even agreed-upon as with more established decks like Twin or Abzan. In this article, I want to look at some common Grixis Delver lists and try to identify key changes that can help this deck perform at upcoming events. Grixis Delver mages have been frantically brewing and testing to get their lists right, and I want to examine some of the major disagreements and technologies that have come out of this. In the end, we’ll have a leaner and meaner list to prove that even without Treasure Cruise, Delver is still a force to be feared. Before we get started, here are two Grixis Delver lists illustrating two overlapping but competing ways of building the deck. The first was piloted by Luke Goodwin at two back-to-back events in early April. He won a TCG States with this one weekend and then an SCG States with it in the next. This kind of consistency is almost unheard of outside of GPs, and although Nebraska might not be the most hopping Modern scene in the States, it’s still a very respectable finish we need to appreciate. I’m going to call this “Traditional Grixis Delver” because it follows a very traditional approach to both Delver decks and Grixis Delver lists. The second list is a more aggressive approach to Grixis Delver, favoring larger delve creatures and heavier removal options instead of Tempo staples like Pyormancer and black staples like Inquisition. This list has gone 4-0 in two separate MTGO Dailies, both piloted by Grixis Delver veteran Lejay (whose lists I have seen a few times in my MTGO data entry). Here’s his/her list from 4/27, which I am affectionately calling “Big Grixis Delver” because of its 4 maindecked Anglers. These lists do not represent every Grixis Delver configuration in Modern, but they are the two kinds of lists I am going to discuss today. A lot of the card choice tensions I touch on later are apparent in these lists, and if we want to have a shot at these upcoming GPs, we need to understand and reconcile those differences. When tuning a list like Grixis Delver, one with a lot of promising early results but no big stage victories, we need to be very clear about what we are tuning for. Because the deck is so new (relatively speaking), it’s hard to know if it is enjoying popularity because of flavor of the month craze, a genuine power level, or some combination of this and other factors (Delver nostalgia!). If we speculate too much on all the reasons the deck is good or bad, we are never going to know what to tune for. Modern has too many matchups we need to worry about as is. We can’t add a layer of speculative theorycrafting on top of that too. This means we need to focus on tuning Grixis Delver around what we know, not what we hope to find out in a few months. And what we know right now, or at least what I think we can reasonable believe, is the following. It is rare that a deck’s theoretical strengths are so strongly reflected in quantitative data. Grixis Delver is such a deck. On paper, the different Grixis Delver lists look incredibly strong against Twin. They have cheap removal and countermagic. They have fast clocks and resilient threats. They have tempo gameplans that allow them to drop threats and then hold the line while the threat goes to work. This is exactly the sort of approach you want against Twin (one of them, anyway), and it feels very much like the days of TC-based UR Delver, when Twin was all but absent from Modern. How does that work in practice? All things considered, just as well as it works on paper. Looking at the MTGO Deep Dive Dataset, I found Grixis Delver to sport a nasty 11/13 (85%) match win percentage against UR Twin. Although I’m sure the “true” MWP for this matchup is closer to 60%-70%, that’s still an insane place for a new deck to be. When you see numbers like that, it’s no wonder Grixis Delver has risen so rapidly through the MTGO ranks. Even the hottest new decks have both success and failure stories, and Grixis Delver is no exception. Beating UR Twin is the good news. Getting smashed by Abzan is the bad news. Like with the UR Twin matchup, this is something we can confirm both qualitatively and quantitatively. From a theoretical perspective, Delver decks have never been great against BGx. In fact, before TC and Dig Through Time gave them a way to refuel from early exchanges, BGx decks were the main reason Devler wasn’t very viable in Modern. Abrupt Decay is as much a beating in real life as it is on paper. So are the hardy Abzan threats that can’t be profitably burnt out, not to mention discard magic that can’t really be countered. In practice, it’s just as bad as it sounds: the MTGO Deep Dive found Grixis Delver going 1/9 (11%) against Abzan. The true MWP of this matchup is probably closer to 30%-40%, but that’s still not where you want to be against a deck that is probably the “best”, and certainly the most enduring, deck in the format. Our tuning needs to stay focused on these two baselines. We want to make changes that do some combination of the following: improve our Abzan matchup, don’t hurt our Twin matchup, don’t make our Abzan matchup even worse, don’t help the Abzan matchup at the expense of hurting the Twin matchup, etc. Of course, we also don’t want to make changes that will adversely impact other matchups. For instance, if we maindecked Thoughtseize, this might further improve our Twin matchup, but would definitely hurt our Burn matchup. We don’t necessarily want zero-sum changes, although maybe it’s worth it to trade a little in one department for a little in another. All in all, this is how we need to orient our thinking towards tuning at this stage, and this is where I am going to approach the process from. This second manabase appears to be a sizable improvement over the first. It’s much stronger against Burn and Affinity, not to mention all the other random aggro decks like Merfolk, Zoo variants, etc. I am particularly fond of Darkslick Shores, because Grixis Delver is the best of the three-colored Delver decks to support fastlands. Sultai and Esper Delver can use Shores too, but non-red Delver is pretty terrible in Modern so that’s already a nonstarter. Jeskai Delver can use Seachrome Coast, but Geist of Saint Traft and Seeker of the Way are worse positioned than Tasigur and company. Same goes for Path to Exile versus Terminate (although Helix is still quite strong). Temur Delver may have Goyf to compete with the delve-fatties, but Copperline Gorge is the only fastland that deck can play, and Gorge turns off too many turn 1 blue-based plays. This gives Grixis Delver a competitive edge over other tempo decks in a metagame that rewards painless, three-colored manafixing. As a final comment on manabases, Big Grixis is using 7 fetchlands as compared to Traditional Grixis’s 9. If you want to run 2-3 Blood Moon out of the board, 8-9 fetchlands seems better than 7. This guarantees you have all the mana in place to cast other spells and drop a Moon on turn 3 to ruin your opponent’s day. More fetches are also going to help us cast the delve spells, which will become more important in the next section. The most glaring difference between the Traditional and Big Grixis lists are in these two creatures. Young Pyromancer is a staple URx Delver tempo effect that quickly takes over games if unanswerered. Gurmag Angler is a 5/5 monster that can toe-to-toe almost any big creature in the format, including the average 4/5 Goyf, opposing Tasigurs, and Siege Rhino. Grixis pilots are unsure about which to run or even what combination of the two to run, because there are clear benefits and costs to any combination of Angler/Pyro. Instead of theorizing too heavily about Pyro and Angler in a vacuum, I want to think about these two cards with respect to our baseline assumptions. That is, how do these cards affect our Abzan and Twin matchups? Let’s start with Pyromancer because he has historically been a Delver posterchild. Pyro’s biggest advantage against Abzan is protection against Liliana of the Veil, effectively “turning off” 3-4 pieces of Abzan removal. He’s also great at clogging boards, particularly against Goyfs and Tas’s, and at being a “remove or die” threat that just gets better the longer he goes unanswered. This last point is important against Twin, which will typically switch to a more controlling approach against a Delver deck full of countermagic and spot removal. If they expend resources to kill Pyro, you still probably get a token out of the exchange and now Twin is behind a card and some mana. If they don’t, Pyro takes over the game while Twin tries to interact with you. Pyro’s biggest weaknesses are that he’s relatively slow, quite fragile to removal, and not a game-saving turn 4 topdeck in bad situations. Angler brings a different set of strengths to Grixis Delver. Most obviously, it’s just a massive creature. Unless Lily is in the graveyard, Abzan’s Goyf will be stuck at 4/5 and unable to brawl with an Angler. Nor can Rhino or Tas. Twin can’t profitably burn Angler, Abzan can’t Decay it, and both decks need to answer it immediately or quickly fall behind in a race. Against Twin, Angler’s biggest weakness is Remand, but once the fish sticks, he’s there for life. Against Abzan, Angler is soft to Path (like everything else) and more importantly soft to Lily (very much unlike Pyromancer). It makes up for this, to some extent, by being too fat to fight, although this too is complicated by Spirit tokens that can get in its way. That all said, there’s another card we need to keep in mind when evaluating Angler: Stubborn Denial. Denial is absolutely unsupportable in a Pyro deck. You need at least 6-8 consistently “Ferocious” creatures to ensure Denial is good, and Pyro decks just can’t accommodate that. This is too bad, because Denial is brutal in tandem with Angler. Going turn 3 Angler with one mana open for Denial is an almost unbeatable line of play against both Abzan and Twin. As many of you may have noticed, this isn’t an “either-or” situation. We are totally capable of running both Pyro and Angler in the same deck (the same can’t be said of Denial and Pyro, however). From what I have seen of Grixis Delver and the overall metagame, I think this split is the best approach. After all, 4 Pyromancer is almost always going to be too many, so trimming to 3 leaves you at least 1 more slot open for additional threats. This might suggest a 3-1 split between Pyro-Angler. But I would actually push this further to a 3-2 split for two reasons. The first is Pyromancer’s weakness to Abzan strategies. Elemental tokens don’t do anything against either Rhino, Lingering Souls, or Treetop Village, and you are more likely to be staring down those cards than staring down Lily. Moreover, many Abzan decks are actually going down to 3 Lily in this current metagame, further limiting Pyro’s effectiveness against her. We are also seeing BGx decks play more cards like Zealous Persecution and/or Golgari Charm in the sideboard or maindeck (Gerrard Fabiano’s Sultai Control ran Charm main). This makes Pyro weaker but keeps Angler as a strong option. Lily’s decline is particularly favorable for Angler. The second reason to go 3-2 on Pyro-Angler is broader metagame context. Affinity, Merfolk, Collected Company Podless Pod, and, of course, Grixis Delver are all on the rise in Modern. This is going to lead to more decks running sweepers like Pyroclasm and Anger of the Gods to combat them. We are also seeing more BRx midrange and control decks emerging that will be capable of adopting these countermeasures, notably the return of Jund. These conditions are going to make Pyro a little worse as the metagame progresses. But they will be perfect for Angler to thrive. So why not go all-in on Angler? 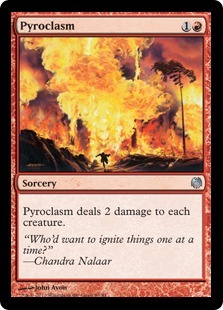 Pyro is still an excellent card and is one of the big reasons this deck is so good against Twin. We don’t want to compromise that by ditching too many of them. At most, I would do a 2-2 split between Pyro-Angler, although I still advise 3-2 for most metagames. As for Denial, it’s a good card, but it isn’t giving us a huge edge in matchups where we aren’t already doing well. Another important question raised by the Traditional and Big Grixis lists is about Terminate and Murderous Cut. Big Grixis went all-in on Terminate, upping the count to 4 and showing Abzan decks they weren’t the only black-based strategies playing efficient kill spells. Traditional Grixis kept that down to 1 copy, running 2 Cut in place of the other copies. In a deck like this, I think Cut is going to be a mistake for a few reasons. Grixis Delver is only capable of supporting so many delve spells. Based on counts from the TC Delver era, we would pinpoint this delve ceiling at around 4 cards. Maybe 5, depending on what enablers we were using. This means we need to weigh the relative strengths and weaknesses of different delve options. Unfortunately for Cut, this is where Terminate gets the edge. Even at its absolute best, Cut is only one less mana than Terminate. At its worst, it will be twice as expensive (or more). This puts us in awkward turn 2-3 positions where we need to be conservative with dropping a threat like Tas versus saving cards in the yard to play a cost-effective Cut. Moreover, what we gain from a 1 mana Terminate is way less than what we gain from a giant 5/5 monster shoring up our threat base. Terminate is still basically Terminate at 1 or 2 mana. It doesn’t really improve our deck’s reach. But packing a 5/5 behemoth in a low-toughness Tempo deck gives us an entirely different set of gameplay options. This kind of threat diversity makes Grixis Delver much harder to play against. Because we can’t support both Angler and Cut in the same list, the competitive advantage goes to Angler for giving us much more bang for our delve buck. There are also other cards I want to talk about eventually (Kolaghan’s Command, for one), but this is a good starting point. (EDIT: 4/29) And there’s still the giant question of the sideboard: this one is basically a copy of the Traditional Delver sideboard above. But those are questions for another article. Of course, it is totally possible that the lists we see in June will do things differently, but I think this more hybridized version of Grixis Delver has a lot of promise for the competitive scene. I’m looking forward to more work with Grixis Delver, whatever its form, and to see those results it will inevitably put up in a few months. I came to the same conclusions RE: the creature set up. In a ton of match ups, people just can’t answer a quick 4/5 or a 5/5, and anything that blocks Goyf has my heart. I think Murderous Cut was a big blindspot for me, because it’s sat in my deck for so long with out consideration. Though, I’m curious why no Deprive? Delver is a deck that can get away with the restriction, and I think hard counters trump Remand in almost every match up. Awesome article! What do you think about Death’s Shadow in the board for the Burn match up? Thanks! What’s your opinion of the Grixis Delve lists that are running no Delvers at all but are instead focused on hand disruption and running out the big creatures? Like the one Caleb Durward tested on CF that had Lily’s main and counters in the side. I know it’s different that what we’re talking about here, but it’s in the ballpark, and I think that build probably has a better game against Abzan. I think what this analysis is missing is a discussion regarding the sideboard and why you chose what you did. Didn’t realise I was able to post Anonymously – probably something you should look at. I added a note to clarify the sideboard. It’s just a straight copy-paste from the list above. Sideboarding is such a big issue that I would want to devote an entire article to it. This one was basically about the maindeck. But definitely an important point to address in the future! Which is really to say, do you want to run Lightning Bolt? The answer to this, I think, is yes. awesome article, great read! I was toying around with Grixis Delver when the ban came out but never fully jumped in. I’ m glad to see the deck is taking off and will be happy to join the club once I get my hands on some snapcasters. Glad you enjoyed! I plan on writing some more Grixis Delver pieces over the next few weeks. The metagame movement is just unbelievable, and I am continually struck by how strong the Twin matchup is. These are great predictors of top-tier success in Modern, so I’m happy to see other players are as excited as I am. Newbie to Modern here (coming from Legacy), am gonna be completing this deck by tomorrow. Gonna try out your list instead of my homebrew for a dry run! Nice. Definitely report back with anything you find. In particular, I’m curious to hear how the 3-2 Pyro/Angler split goes, and if there are enough delve enablers to reliably drop Tas/Angler when they are needed. Little surprised at the lack of kol command, card has been insane for me with snap. For junk my plan has been fulminator mages with the command, if the format continues to slow I’ll probably do a 2/2 split with olten rain to snap those back and push the damage race more. I mentioned KC in the last paragraph as another card I want to discuss. I think it’s definitely sideboard material and even has a lot going for it in the maindeck. I also think it’s a tricky card to evaluate, so I want to actually run some tests with it before committing to any stance on the card. So expect to see this card discussed in a future article. The Fulminator/KC plan seems brutal against Abzan, but there might be other ways to beat Abzan without committing so many cards to the plan. 18 vs 19 lands: If I look at the sideboard and the number of 4 CMC spells there I’m just wondering if going up to 19 is possibly the better call. I think it also allows for the potential to go up to 5 CMC (specifically Batterskull and Keranos – but that could be getting greedy). I think Mana Leak is the cut. Also this in line with the more controlling aspect of the deck. Manabase composition: With Angler and Tasigur – and Snapcaster to a degree – fighting for our graveyard, I’d want to be running something like 9 fetches, 6 shocks, 3-4 basics. That gives you the best opportunity to fill the graveyard and delve away. Remand vs. Terminate: I feel these are fighting over six slots in the deck. I’m not sure that 2/4 in favour of Terminate is correct, this will need to be tested. Remand is the ultimate in Tempo cards, it feels wrong to only play two. (I might even be tempted to drop Angler in favour of the two Remands – but not just yet). Thought Scour: This feels like heresy, but I’m thinking we can cut one of these (possibly for another Electrolyze). The gameplan is usually to turn 1 a Delver then flip and ride to victory. Thought Scour is there to allow the ‘busted’ turn 2 Tasigur/Angler play (although those are both rather rare). What if instead of playing ‘bad cards’ (of which Thought Scour is one), we just naturally fill our graveyard (per Delver Cruise) and cast Tasigur/Angler later with protection and ride it to victory then. Blood Moon – can’t leave home without it. Definitely running 2-3 of these. Magma Spray – was for Pod, Infect and Affinity (and mirror). Is Terminate enough now? Just wondering if we’d be wanting to add to our instant speed removal. Could Burst Lightning now that the exile effect is largely irrelevant. If you expect the mirror, I’d be wanting some 1 CMC instant speed removal. Shatterstorm – because everyone hates Affinity. Curse of Death’s Hold – stolen from Esper Mentor. If we can go up to 5 CMC then why not? I just want to point out that Lejay’s real name is Jean-Marie Accart, and he has a history as a player you don’t take lightly–he has multiple Bazaar of Moxen top 8’s and solid GP placements. IDR if he has a GP top 8 or not, but he has a fairly high pedigree as a player. Good information to have. Hopefully nothing I said came off as taking him or his Grixis Delver experience lightly, because I definitely like the direction he took the deck. That said, we are seeing multiple kinds of Grixis Delver lists on MTGO, all of which are enjoying similar success rates. So it’s about trying to reconcile those differences and figure out where some cards might be better than others. I’m curious as to your thoughts on Tombstalker. It’s one B more than Angler, but I feel like it improves matchups with fliers for Delver. Soul sisters, any decks with Lingering Souls, decks with dragons all improve I think. The cost is obviously much higher though. BB is pretty difficult to reach, it would require fetching Watery Grave and Blood Crypt – which limits you on U.
I want to start by saying that I love the website and the content. Two thumbs way up. This deck really interests me and I want to trade into it. However, I am not an astute meta-game observer so my question is, will this deck stick around? It looks a blast to play, and there is a lot of Twin where I play. I just don’t want to get burned by the meta-game if somehow it tanks in playability. It’s worst two match-ups are the mainstays of the format (Burn and BGx decks). This doesn’t mean its going to turn bad, it just means that when there’s a meta shake-up and everyone runs to their staple decks its going to have a bad time while everything sorts itself out in the background. On the plus side, you’re a set of Splinter Twins (reprinted in MM), 2 Cryptic Commands (also reprinted) and a bunch of commons/uncommons away from Twin – which would be an easy ‘go to’ deck for yourself (good against burn, only a slight underdog to BGx). There is one card that I am very surprised hasn’t seen play in a delver deck yet. It is Vampire Nighthawk. I play 4 and find it to stop burn in its tracks every time. I win around 50-60% of the time against burn in game 1 on the draw. It is purely from having a source of lifegain in the maindeck. I know it dies to one bolt, but I find if I chump block their early creatures with Delver of Secrets and the occasional Tasigur, I can hold off their creatures and counter the important burn spells until I land 1-2 Nighthawk. Even if they die, I usually can gain 2-4 life from each and then they are also down 3 damage of burn for each, so they save me 5-7 life each. I think that’s worth it for 3 mana, especially because I can bock their creatures as well. I’m not sure I would agree with this. It dies to both Bolt, AND Helix/Searing Blaze. Command can just ignore the lifegain when they swing on turn 3 (and kill the Hawk if they pump with it). Plus you can’t play it into a suspended Rift Bolt. That’s a lot of cards and situations into which I don’t want to tap out for Hawk on turn 3. I’d much rather just play an Angler or a burn spell with Dispel/Negate backup and try to keep that tempo gameplay going. Tapping out is really a bad plan there. I know it dies to basically every card in a burn deck, but not if you play it on turn 5 or 6. Burn is survivable for that long if sufficient counters and removal are used. I know from a theoretical standpoint Nighthawk should never work in any circumstance, but I have had surprising success with Nighthawks against burn. Searing Blaze is the only card to watch out for, but it can be countered. Nighthawks aren’t good in a vacuum, but I have found that they can be great tools if used correctly and supported, which is what delver specializes in. Burn usually has an empty hand around turn 4 and then goes topdecking for a closer or just uses Grim Lavamancer to burn to death over a few turns. If they have to topdeck into an answer for a turn 5 Nighthawk (which I don’t play until I am clean out of counters), then they will not get the landfall for Searing Blaze and have to use a less efficient burn spell. In the meantime I can just block their creatures and gain life if they are still attacking, or just wait to draw into more counters or removal or nighthawks. Because of the cantrips in delver, I usually am casting 2 nighthawk on turns 5 and 6 which is almost unbeatable. 1 nighthawk is handleable, but 2 is too many. Like I said, theory suggests that nighthawk shouldn’t work, but in actual play he has proven very helpful for me.